Sourced from native Eucalyptus Marginata trees, Active Jarrah honey is Western Australia’s very own super honey that cannot be produced anywhere else in the world! Its activity level is measured by the standard (phenol) bacteria-killing scale for Total Activity (TA) levels. 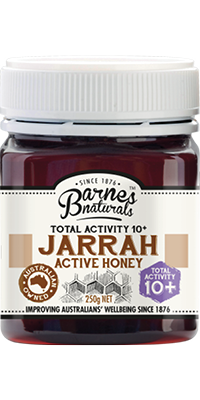 Every drop of our Jarrah honey is independently tested for its activity level. Super Honey – unique to Australia! Jarrah trees are a large forest tree predominantly found in the state’s southwest, from north of Perth to as far south as Albany. They are a slow growing Eucalyptus that can reach 40 metres in height and can live up to 1000 years. Jarrah trees only flower every two years, usually from December through to January in the early summer, and when in bloom are magnificently covered in beautiful creamy-white flowers. Jarrah produces a deliciously dark and thick honey with an aftertaste likened to salted caramel. However, this honey is not as sweet as other honeys due to its low glucose and high fructose levels and for this reason pure Jarrah honey is not prone to crystallisation. Independently tested to guarantee a Total Activity (TA) 10+ rating. Available in a 250g and convenient 500g pack. Our Jarrah honey proudly displays the certified authentic Western Australian Jarrah Honey Logo. Suitable for consumption and topical use. 100% Pure Active Australian Jarrah Honey. Store below 25°C and to ensure activity, consume within 24 months. Suitable for children 12 months and older.